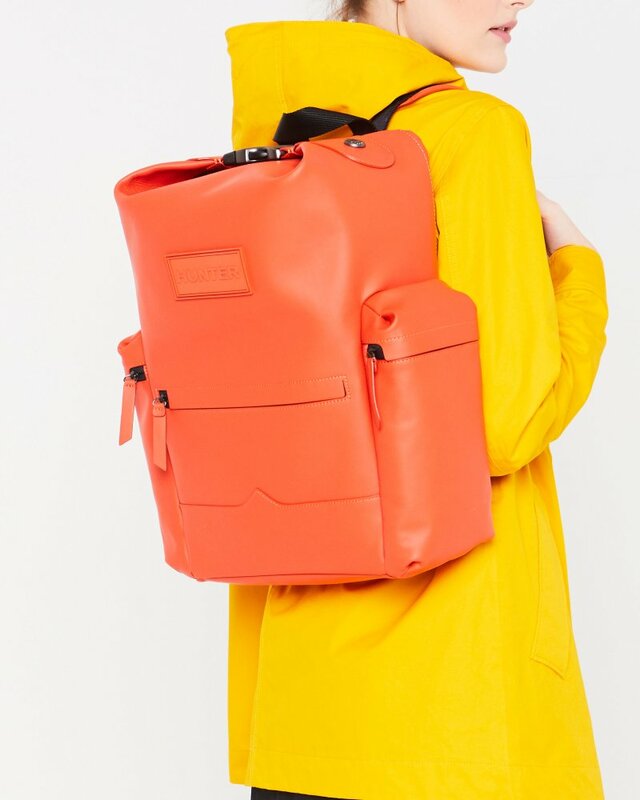 A practical, weatherproof backpack crafted from water-resistant rubberised leather. This bestselling style in fiery orange is secured with a parachute clip and zip at the top, while the moustache detail at the front references our Original Tall Wellington boot. This spacious backpack has plenty of room for all the essentials with a depth of 11.5cm and a 17L capacity. An easy-access neoprene back pocket allows for safe storage of a 13.5" laptop while the padded adjustable straps offer increased comfort. Rated 5 out of 5 by Glen from Really well made. Amazing bag. Exactly what I wanted. Not too big as it looks in the pictures. Just perfect. Rated 3 out of 5 by Jezzie from Zip comes apart on neoprene back pocket Zip comes apart in the laptop compartment (neoprene back pocket) when/ if the laptop is thicker than the latest thinner ones. Luckily enough, that is amendable if you remove the laptop and zip returns to normal. But defeats the function of that useful laptop compartment. Apart from that, it is a very functional and good sized backpack. Especially useful on an overnight trip! Needless to say, it’s a very good looking bag too. Rated 5 out of 5 by Anonymous from Big, stylish and practical. Very stylish but practical rucksack. I got the orange one and I think it’s fab. Rated 5 out of 5 by karen67 from looks and feels fabulous! It was a chosen Christmas present but even so it was an exciting parcel to open! Rated 5 out of 5 by Myles from Great bag I this is the best bag that I have ever bought, thank you sooo mucccchhh!!! Rated 5 out of 5 by Steve from Best Bag Ever By far the best backpack I have ever purchased. Suitable for all occasions from traveling around to business meetings. I regularly get commented on the awesome look and it's practical for my every day needs, such as carrying laptop and clothing items. Slick design and very high quality materials and finish. 5 STARS!